Monday, while driving home from school, Hubs sent me a text with a picture of the cover of OK! magazine. On said cover was Kris Humphries and Kim Kardashian with the caption "Don't leave me!" Hubs wrote "I told you so." You see, ever since I made Hubs watch a few moments of the Kardashians with me, he has been convinced that the K&K marriage was on the fast track toward divorce. I, ever-the-optimistic-and-faithful-believer, said the marriage would last. I didn't fall for his text for a second. "Ok! magazine is not a credible source!" I texted back. Puh-lease! Doesn't that boy know anything about where he gets his celebrity gossip from? Come on, Hubs, try to keep up! Less than a minute later, I was listening to 97.1 (Pay me, you fools! All I do is advertise for you!) and an announcement came on, "The rumors are true, folks. Kim Kardashian filed for divorce from Kris Humphries this morning. Reason for divorce is listed under irreconciable differences." 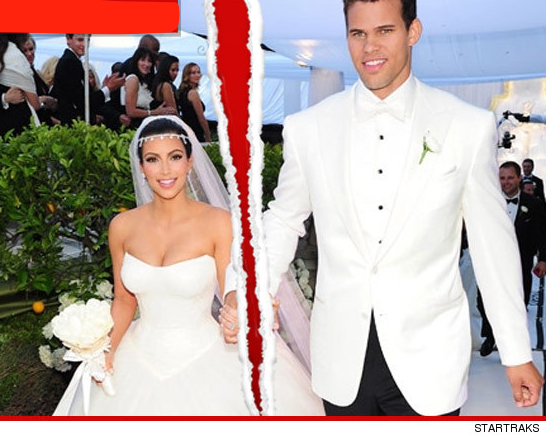 Kim Kardashian and Kris Humphries, after 72 days of marriage, have called it quits. Yes, this is the same wedding I was recently watching while experiencing mad fits of jealousy over the millions of dollars worth of diamonds, the multiple wedding dresses, and the endless bouquets of flowers. Now... I know that I don't know Kim. And I know I should not be affected by things that happen in her life. I know that I might actually be a much happier person if I stayed the h*** away from all celebrity gossip. I am affected by the news of the divorce. I myself am a newlywed. I have only been married for 235 days. And I still don't know a lot about marriage. In fact, I consider myself a very inexperienced and imperfect marriage partner. Sometimes marriage is about making the other person feel loved. Sometimes marriage is about being there when the other experiences a great disappointment or heartache. Sometimes marriage is about making sacrifices that you don't want to make. Sometimes marriage is about working through complete differences of opinion. Sometimes you get in arguments when you're married. Sometimes you have to be careful what you say and realize your words can hurt. Sometimes you go to bed upset. Sometimes you go to bed really upset. Sometimes being married is about patience and working through problems together. Sometimes marriage is about growing together. Sometimes marriage brings you such great feelings of peace and protection and love that you get overwhelmed if you think about it too long. Sometimes your heart is so full of love that you think it'll just burst if there is any more love. And sometimes you think how in the world did I ever meet this person and convince him to marry me? And then you have to sit down for a minute and just cry because you realize you are so so blessed to have that person in your life. And that is why I am affected by the news of Kim's divorce. Oh my gosh. I could have written this post. I was so sad when I heard the news and Colin was like. "I told you so." I feel like I know them so I was so upset and frankly I am not over it yet. Kim needs to not be so selfish. I loved everything you said on "what marriage is about." I'm getting married this year so it's fun reading things newleyweds have to say :) sorry I'm blowing you up with comments tonight! !